Gulfport's lone casino, the Island View Casino Resort, opened in September 2006 after the local owners of the Katrina-destroyed Copa Casino bought the Harrah's Grand Casino Gulfport property and turned it into a quality resort. More than 500 rooms occupy the Island View Casino Resort, where guests enjoy pillow-top mattresses, LCD TVs and refrigerators in every room. Suites are also available with luxurious linens and plasma TVs. The 83,000-square-foot gaming floor features more than 2,000 slot machines and 47 table games, from blackjack and poker to craps and roulette. One of the premier restaurants on the Gulf Coast sits inside the Island View Casino Resort. Kick it up a notch at Emeril's Gulf Coast Fish House, another fabulous seafood restaurant by renowned chef Emeril Lagasse. The Island View Buffet is open daily for lunch and dinner, where you can enjoy a live-action cooking area, carving station and much more for under $20. Enjoy a nightcap at the View Bar with live music every week and happy hour every night, and if the late-night hunger pains are striking you, stop in to the C&G Grille for a late-night snack. 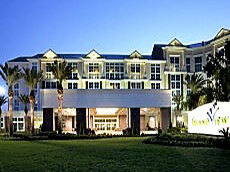 View other casinos located in Biloxi Mississippi.